Marie-Laure lives with her father in Paris within walking distance of the Museum of Natural History where he works as the master of the locks (there are thousands of locks in the museum). When she is six, she goes blind, and her father builds her a model of their neighborhood, every house, every manhole, so she can memorize it with her fingers and navigate the real streets with her feet and cane. 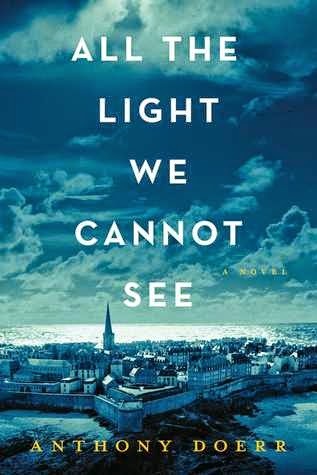 When the Germans occupy Paris, father and daughter flee to Saint-Malo on the Brittany coast, where Marie-Laure's agoraphobic great uncle lives in a tall, narrow house by the sea wall. Review: This book was absolute perfection. Told in alternating timelines with multiple narratives, we follow Marie-Laure and her father as they flee Paris as well as a young German orphan named Werner who ends up at a military academy for Hitler Youth. The writing was absolutely beautiful and I was quickly engrossed in the story. It's only January but this is without question my favorite read of the year thus far. Fantastic.